For Hyperculture, Rael San Fratello Architects and Ga-Ga bought a plot of land in Iowa normally cultivated for corn and by turning it into an “interface” present alternatives to the monoculture of industrial agriculture. Using the same digital tools that produce straight rows of corn, we create an overlay of imagery organized by polyculture. These images change appearance at different “zoom”s, when viewed from above using Google Earth. At altitude +20 km, an image of a chimerical plant appears – not a logo, but a figment composed of multiple species: wild garlic, winter rye, vetch and corn. Zooming in closer to +2 km, each 40-acre parcel breaks into a more abstract pattern of diversely planted rows. Closer still, the rows are tagged with information and a photo of the crops. The Google Earth interface and earth interface unite at this moment, as satellites both direct and mediate food production. In what sounds like a digitally ornamented CornCam or FarmVille but with a real-world terrestrial component, you control the workings of an actual field. 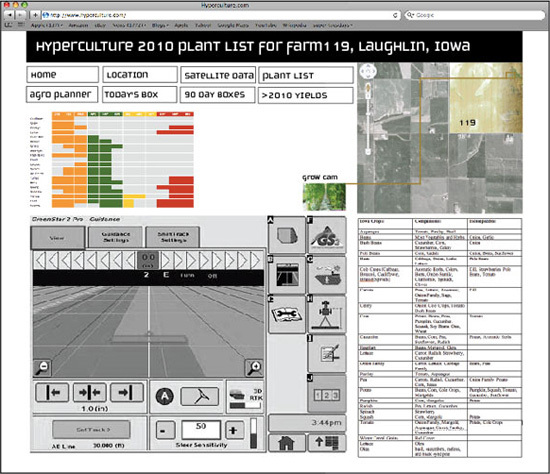 In counter-hyperlocalism style, you program a cadre of farm machinery to till and manage a more variegated crop list using a web interface. It's agriculture informed by digital fabrication, whereby new ecological forms are printed using computer aided techniques. Perhaps Hyperculture can be reconfigured into a social network game. The whole of Iowa is parsed into small parcels, and each one can be cultivated virtually through an interface on Facebook or with a standalone app. What gets farmed and the quality of the harvest will depend on how much “farm gold” the gamer has to spend on machinery, seeds, water and gasoline. The plot of land can turn out to be an Edenic garden, a recreation of the Dust Bowl or somewhere in between. If one tires of it, then the farm is considered abandoned and allowed to turn feral; given enough time, it might fully revert back to its pre-settlement condition. If a system error occurs, nudge the resident Farmer-SysOps to reboot the gamespace.